Most algae are harmless and are an important part of the food web. Algae are naturally present in slow moving streams, lakes, marine waters and ponds in low numbers. Certain types can become abundant and form blooms under the right conditions. 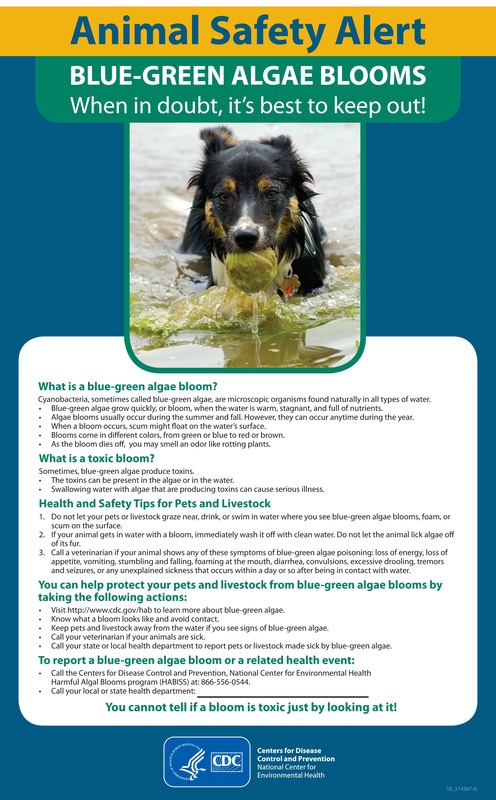 Some algae can produce toxins that can be harmful to people and animals. These are collectively called harmful algal blooms (HABs). 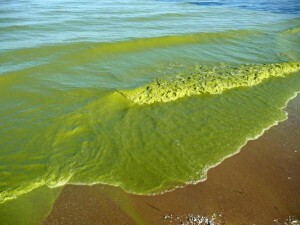 Algae blooms most frequently occur in nutrient-rich waters, particularly during hot, calm weather. Because it is hard to tell a harmful algae bloom from other algae blooms, we recommend avoiding contact with any floating rafts, scums, and discolored water. Find out what water bodies have a blue-green algal bloom notice. Blue-green algae, technically known as cyanobacteria, are naturally present in lakes and streams in low numbers. Blue-green algae can form HABs that discolor the water or produce floating rafts or scums on the surface of the water. These can cause health risks to people and animals when they are exposed to them. Blue-green algae blooms can occur in freshwater lakes and ponds and can reduce the recreational value of a water body, due to unpleasant appearances and odors, and can cause a variety of ecological problems, such as reduced oxygen levels. They also have the potential to form harmful (toxic) blue-green algal blooms, although the factors that cause blue-green algae to produce toxins are not well understood. Harmful blue-green algae blooms can cause health effects when people and animals come in contact with them. Symptoms can include nausea, vomiting, diarrhea, skin or throat irritation, allergic reactions or breathing difficulties. Blue-green algae can also produce toxins that affect the liver and nervous systems when water is consumed in sufficient quantities.